Are you looking to navigate the world of "at home" working? The good news is that telecommuting options, especially in the technical field, abound and continue to grow. However, if in your job search, you're not finding these jobs, it means you're looking in the wrong places. It's unfortunate that when most people decide to work-at-home, they begin their search by trying to find an option they can sign-up for starting today. This, of course, leads to increased chances of finding scams or getting involved in work-at-home schemes that don't interest you. The reality is that work-at-home jobs are just like traditional jobs. If you were looking for a tech job outside the home, would you do a Google search on "jobs"? I don't think so. Instead, you'd probably visit job search sites and search for work related to your skills. It's the same with work-at-home jobs. First, it's much easier to turn a traditional job into a work-at-home position, than finding and getting hired to a telecommuting job. 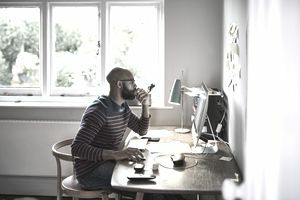 So, if you're currently working in a job, consider researching the viability of turning it into a telecommuting position and preparing a work-at-home proposal to present to your employer. The key aspect to focus on isn't how badly you need the flexibility to work-at-home, but instead, how your working at home can benefit your employees, such as increased productivity or reduced stress on office resources. If your boss says, "no," your next step is to find a work-at-home job. Start by listing all the jobs you're experienced and qualified to do. Don't think just in terms of job titles, but in duties as well. Next, write a resume that highlights your skills and experiences. While most view the resume as a list of accomplishments, you're better off viewing it as a marketing document. In marketing, the focus is not on you, but on how you can help the market, in this case, the employer. So work to write a resume that offers specific and quantifiable data in a way that shows how your experience helps the employer. This version of your resume will be generic, but you'll want to tailor it to each job you find in your search to make it stand out to employers even more. Once you know what you have to offer an employer and a resume to tweak, it's time to start searching for work. Search your city (i.e. New York) and keyword telecommute. Scroll through the list of options. Read carefully as some may say, "no telecommute." You'll need to register with Dice to submit your resume. If you don't find jobs in your city, you can leave the city option blank. However, since many companies with telecommuting options still prefer local candidates, start with the city option. If telecommute doesn't yield results or for other results that don't show up under that term, use keywords: remote, virtual, and/or "work at home" (with the quotes). Check out these job search sites for more options. Use the same steps you followed to search Dice, using work-at-home keywords (i.e. telecommute). On the general search sites (i.e. CareerBuilder), use your work-at-home keyword and job industry. For example: telecommute project coordinator. You might want to consider joining FlexJobs, which makes finding telecommuting jobs easier by weeding out the scams and schemes for you. Another option is to register with recruiters who have postings in your line of work. Although many people have mixed results with recruiters. Additionally, if you don't already belong to one, join at least one professional association in your line of work — they often have leads and provide an additional place to network. Note, that many of these jobs will be regular employment including a salary and benefits, while some might be contract jobs. While contract jobs can be good paying and steady, there are differences between telecommuting employment and contract work. If you're still not finding a job that suits you, consider freelancing. There are a number of freelancing sites that have a high number of tech gigs that allow you to work from home. Freelancer.com bought several of them such as RentACoder and VWorker. You can also try UpWork (formally Elance and ODesk). A final option is to start a home business offering your tech services.